3 centre-based: 7 nights, 6 days independent circular walking and between 3 guest houses. 2 centre-based: 6 nights, 5 days circular walking and between 2 guest houses. 1 centre-based: 4 nights, 3 days circular walking. Further nights & days walking can be added to this holiday. Up to 7 nights B&B in quality guest houses and inns or pubs. They are located in delightful historic properties. Picnic lunches can be ordered from your B&B's, although on some days, there will be options to find a country inn as well. Evening meals are taken in local pubs and restaurants. This self guided walking holiday in southern England explores the beautiful countryside of the Cranborne Chase along the area of the Wiltshire / Dorset border. 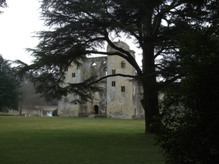 It traverses the inner bounds of the former medieval, royal hunting estate. 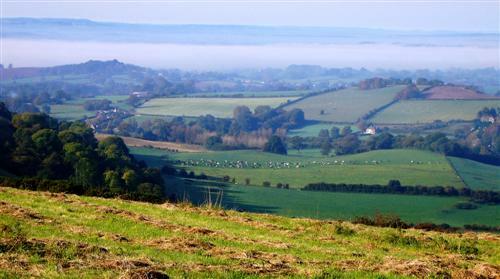 The Cranborne Chase is a chalk plateau that straddles the counties of Dorset, Wiltshire and Hampshire. The downland has a long history with much archaeology from the Neolithic onwards including the Dorset Cursus, the largest example of this class of ancient monument, over 3 times longer than the Great Cursus near Stonehenge. Although very little remains above ground of the Dorset Cursus, later Bronze Age barrow cemeteries appear to have respected its presence, in stark contrast to the Romans who built the Ackling Dyke road across the middle of Wyke Down. You will be able to walk some of the Roman road as well as see many of the ancient eathworks including the unusual ruined 12th century church of Knowlton in the midst of a Neolithic circle. Cranborne Chase was a royal hunting ground from at least the time of William the Conqueror until the 17th century. For centuries the Chase was preserved for kings and their noble relatives. King John is known to have visited at least 14 times to hunt. James I gave it to Robert Cecil, who was created Viscount Cranborne and then Earl of Salisbury. James and Charles I delighted in hunting in the Chase. The Cranborne Chase enjoyed the privileges as well as suffering the restrictions that came with the royal preservation of hunting grounds. The Pitt-Rivers family, who were the last lords of the Chase, could legally impose restrictions on other landowners in the Chase. It was not just a question of the right to kill deer, but no-one was allowed to interfere with the vegetation and you might have to pay a toll to use roads that may be harmful to the deer during breeding season. However, the 'medieval' restrictions had the effect of turning the Chase into an area that attracted smugglers and poachers, so an Act of Parliament ended the preservation of 'vert and venison.' The Cranborne Chase's special qualities are in part due to the restrictions that hunting had imposed. Your 2 or 3 centre-based walk starts in the village of Ludwell from where you can explore the Saxon hill top town of Shaftesbury, with stunning views, lovely historic cottages and of course, the stunningly beautiful Gold Hill as well as Old Wardour Castle as featured in Robin Hood: Prince of Thieves. To reach your 2nd B&B you will climb to the highest point in the area, Win Green with amazing panoramic views, before descending to Tollard Royal. From Farnham, your location for 1, 2 or 3 centre-based holidays, you can explore more of the villages of the Chase including Ashmore and Chettle. To reach your last location for the 3 centre-based holiday you will traverse some of the ancient woodland of the Cranborne Chase along the Dorset/Wiltshire border to the Wiltshire/Hampshire border before descending to Cranborne. 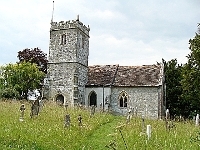 Your final walking day will discover some of the ancient monuments of the region as well as more of the charming villages, such as Wimborne St Giles and Gussage All Saints with their flint banded churches and thatched cottages. A moderate walking holiday with each day's walk averaging 18km or 11 miles with moderate ascents at a time, with maximum daily ascent being 300m. The walk follows many different types of paths, tracks and small country lanes. Occasionaly the walking trail is steep when ascending or descending the chalk escarpments, but in general the walking is relatively gentle in nature. Welcome in guest house in Ludwell (Farnham for 1 centre-based). 7 nights B&B in a variety of small quality guest houses with ensuite accommodation. Mixture of inns or pubs, bed & breakfasts and small hotels. They are located in delightful historic properties, mainly in villages, but some in beautiful locations in the countryside. The B&B's are generally 4 star AA rated. Lunches can be picnic meals ordered from your guest house. Evening meals are taken in your guest house or in local pubs and restaurants. There will be plenty of local food to try and of course the local real ales. A couple examples of the types of guest house we use are shown below. Transfers to and from train stations at Warminster, Castle Cary or Gillingham (Dorset) are included in the price. Routes from London are via Waterloo or Paddington station and take from 1hr 30min to about 2 hrs. 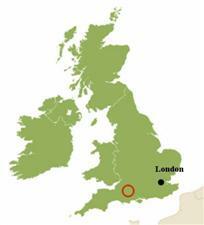 Location is about 1hr 30mins from Bristol Airport, Bournemouth about an hour and London Airports 2 to 3hrs away. National Express operate services to Wincanton from London Victoria.